Atul Auto is one of the leading 3 wheeler auto players in India. It is one of the fastest growing company in this segment as per the website. Below are the brands under which company manufactures the vehicles. This will help you identify the brand and different vehicle types built by the company. The products along these brands are mentioned below. Now that you have an idea about business area company operates in and product it manufactures lets discuss some important points about the Company ( as per company website). As mentioned above it is one of the top 5 manufacturer in this segment. So there will be competition between companies as well. The company will have to compete and gain market share. If the company grows with time it will reward the investors. The growth will be reflected in share price performance. So we will see stock price performance of the company in next segment from IPO days. 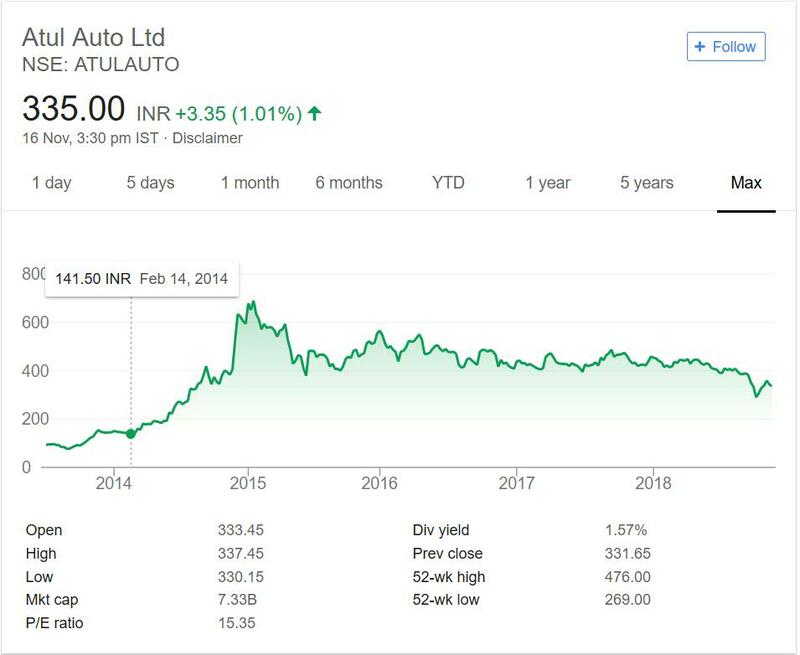 Below graph shows stock price performance of Atul Auto since days of IPO. This will give you clear idea how well company has performed over the years and returns it has given to investors. The company made debut on exchanges in year 2014 at price just below 100. This was bullish time for whole market. The bullish sentiment helped the Atul Auto as well. The company zoomed from 100 odd levels to 600 levels in just months. But after that frenzy movement the stock went into consolidation mode. Since then the stock has not crossed 600 mark and due to recent market correction it came down to 400 mark. Even at this point it has returned 4 times of initial IPO investment. The dividend yield of Atul Auto is good at current market price. It is giving 1.5% dividend at current price. So the investors were benefited with price movement as well as dividend. So far from IPO days company has made good returns for investors. It is interesting to see if it continues to do so in near future as well. Atul Auto is in portfolio of Vijay Kedia.Most of the top investors do not have Auto stocks in their portfolio. So Vijay Kedia has made an exception in including one Auto stock in his portfolio. This makes it an interesting company to analyze and keep an eye on. The eRicksaw market is booming everywhere. If you go to small towns or big cities within few years the usage of eRicksaw has boomed to great extend. The demand for other Auto vehicles will also pick up with growth in Economy. The transport vehicles will be in demand. So there is no question about Auto Sector growth. Important fact is whether the Company can outperform Competitors. Bajaj is one major player in the segment. So you can analyze and compare Atul Auto with likes of Bajaj and see which ones fits in your requirement. Sometimes smaller players grow at faster pace. If they are able to grow their market share at cost of leaders then you have chance to make big money. You can add Atul Auto in your stock watch list. That way you can easily track the progress of Company. It is fast growing and niche player. You can have it in your watch list and monitor the company before making an investment call.